Every year from 15th December to 15th of April, many tourists all over the world come to Cabo San Lucas to assist the spectacular event of watching the humpback whales in their natural environment. Whale watching platforms can be a fantastic tool not just to enjoy wildlife, also to collect a large amount of scientific data for research. One of the techniques to study those whales is through the photo-identification of the individuals. This consists of obtaining a photograph of the underside of the humpback’s fluke. This presents a coloration pattern which varies from completely white to completely black, that together with its border, provide the whale with unique characteristics distinctive for each adult individual (as fingerprints in humans). Once those flukes are compared and animals re-sighted, this provides useful information that allows scientist to know more about their population numbers, behaviours, migration patterns, birth rates and much more. The photo-identification of Los Cabos humpback whales is being done and this is one of the reasons why we have an extent knowledge about the whales that are visiting us every year. What is known so far is that the humpback whales that are seen in Cabo during the whale watching trips, come from northern waters. What photo-identification showed so far is that usually those whales are returning year after year to the same feeding ground. There is an example of a humpback whale seen for the first time in Cabo this year (20th of December) that has been seen in Monterey Bay (California) since 2009 for several years, corroborating this fact. Other sightings also have shown that the whales do not have this much fidelity for the mating and birthing area as Cabo San Lucas is. There are not much re-sighted individuals from one year to the other. Some of the whales seen in Cabo one season, next year are usually seen on a different birthing and mating area. This is the case of the whale called CRC-17037 by www.happywhale.com global database. 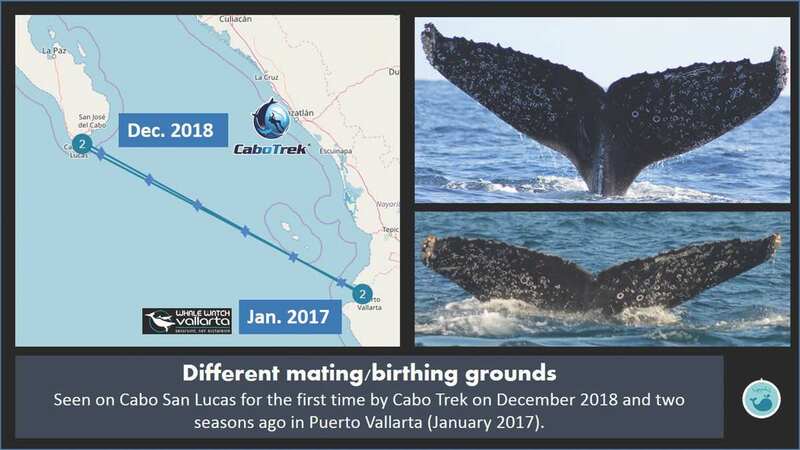 This individual has been seen for the first time in Cabo this season (December 2018) but two seasons ago was seen in the mating/birthing area of Puerto Vallarta (January 2017). This shows that whale watching activity is not just a way to have fun enjoying wildlife, it is also a very powerful tool to increase the knowledge about the whales surrounding our waters with the aim to preserve them.